Firstly, a massive thank you to everyone who took the time to enter and support Lily in the Labyrinth's first ever Giveaway. 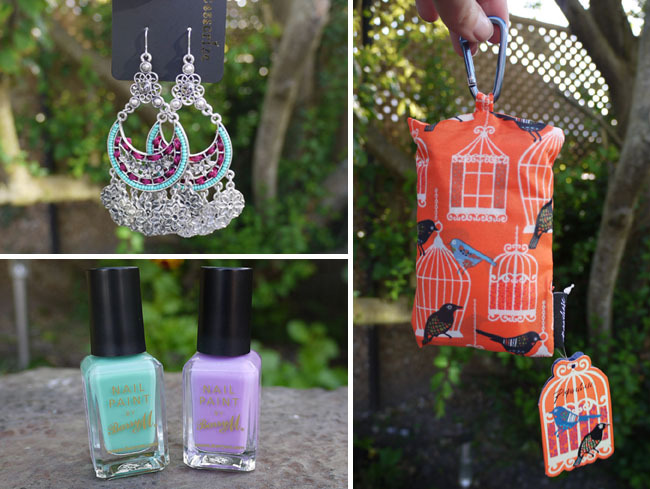 The promotion was a special celebration of the launch of my etsy shop and as such, entrants had the chance to win a product from the shop along with a number of other goodies such as statement Accessorize earrings, a really handy bird-print Paperchase fold-away shopper and two cute nail varnishes from Barry M.
Congratulations Steph! I will drop you an email to confirm so please remember to check your inbox :) To everyone else, I sincerely appreciate your support and can assure you there will be more Giveaways to come here at Lily in the Labyrinth so do keep your eyes peeled. What gorgeous items that were on offer, I love those Accessorize earrings. Steph is a lucky girl!